A couple of months ago, I made some baby quilts for a relative. 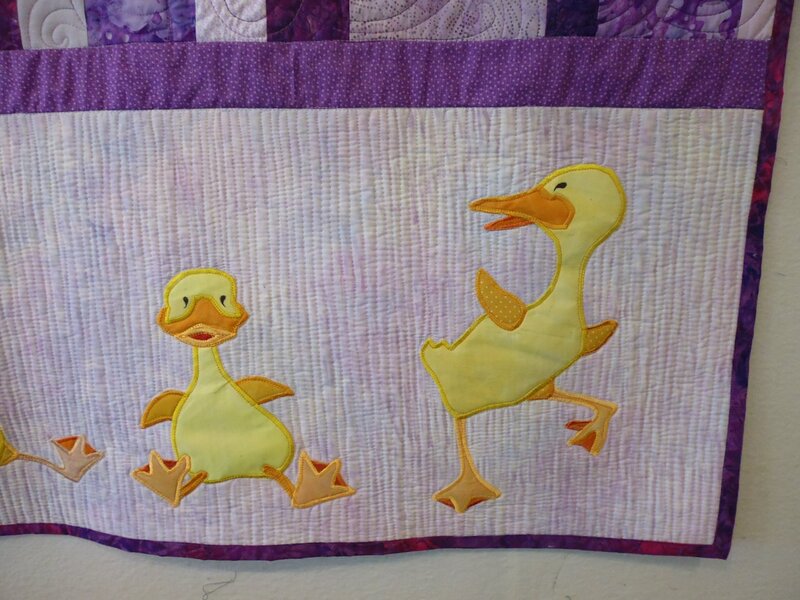 I purchased a duck applique pattern when I was at the New England Quilt Museum’s shop (Lowell, MA) last October. 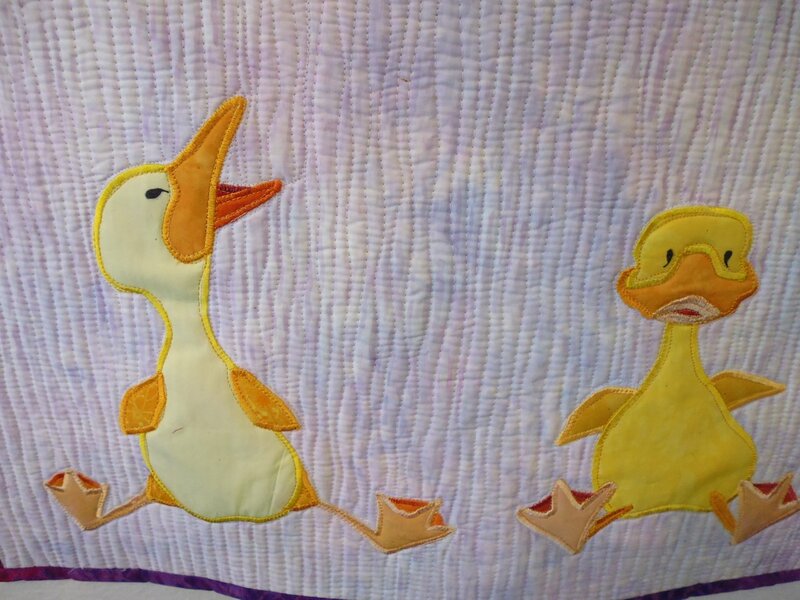 The pattern was for 9 different ducks on the quilt, but after cutting out the pieces for three ducks and knowing I was making three quilts, I figured cutting out nine ducks in total was enough, not 27! I always make gender-neutral baby quilts, even if the recipient knows the gender of the child (she doesn’t) — I just have a thing about the stereotypical pink for girls and blue for boys, and so I make baby quilts in yellows, greens, oranges, and purples instead. 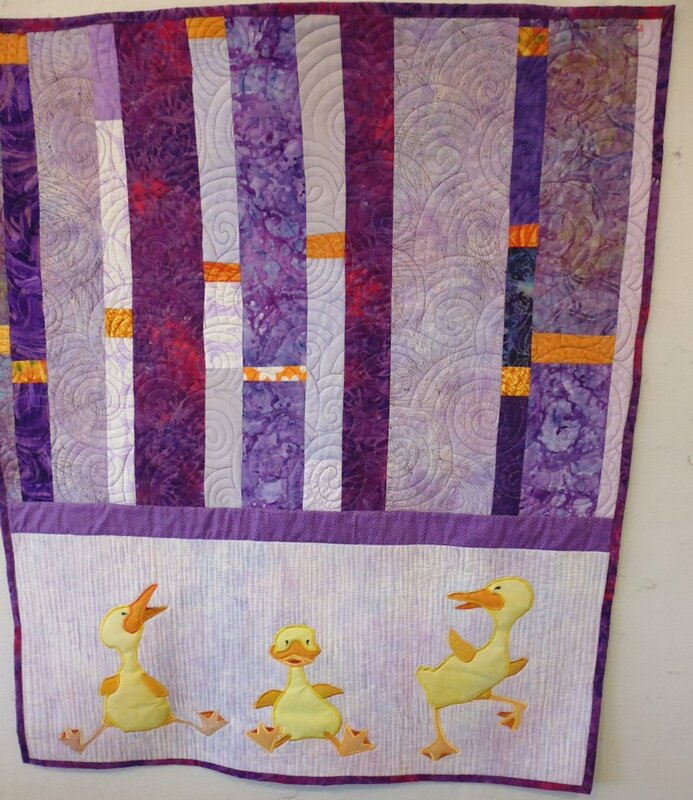 For my niece’s quilts, I chose various shades of purple and of course the yellows and oranges in the ducks. 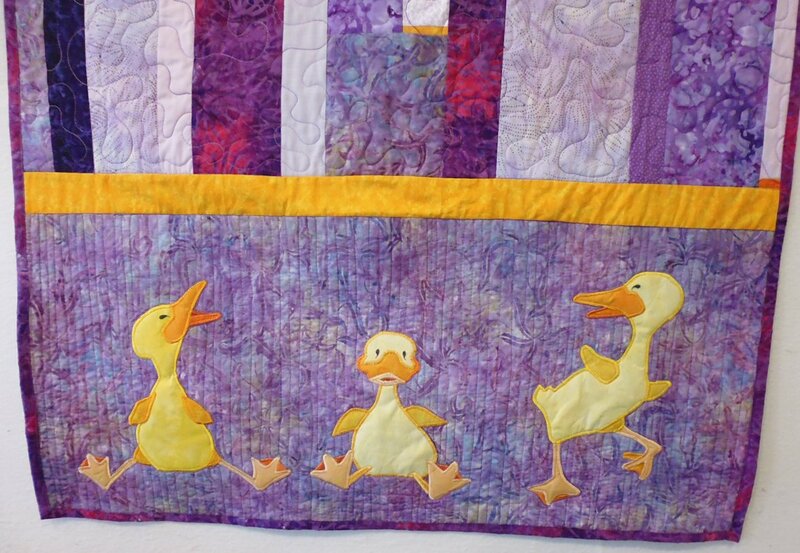 I started by cutting out a wide strip for the ducks, then fusing them in positions where they looked inwards to the centre of the quilt, with the middle duck looking straight out (I call them Huey, Dewey, and Louie). 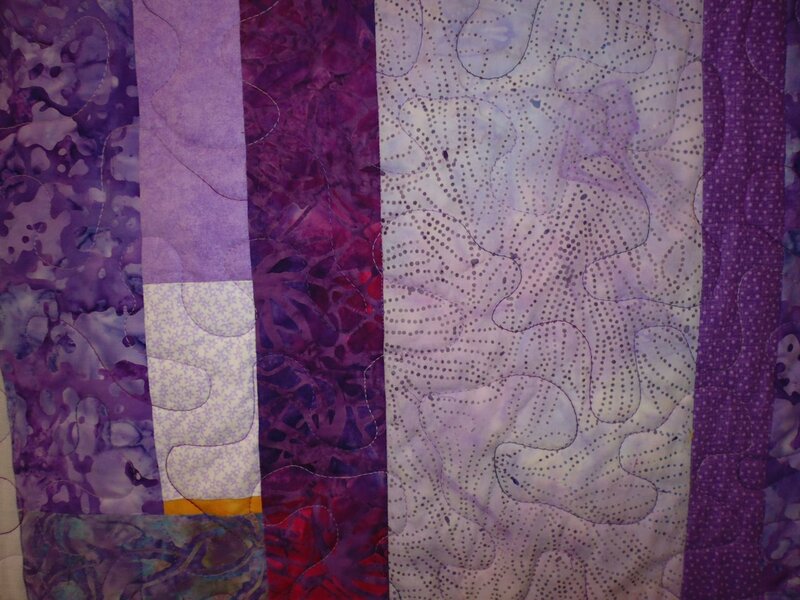 After fusing them in place, I satin stitched around them in matching colours. 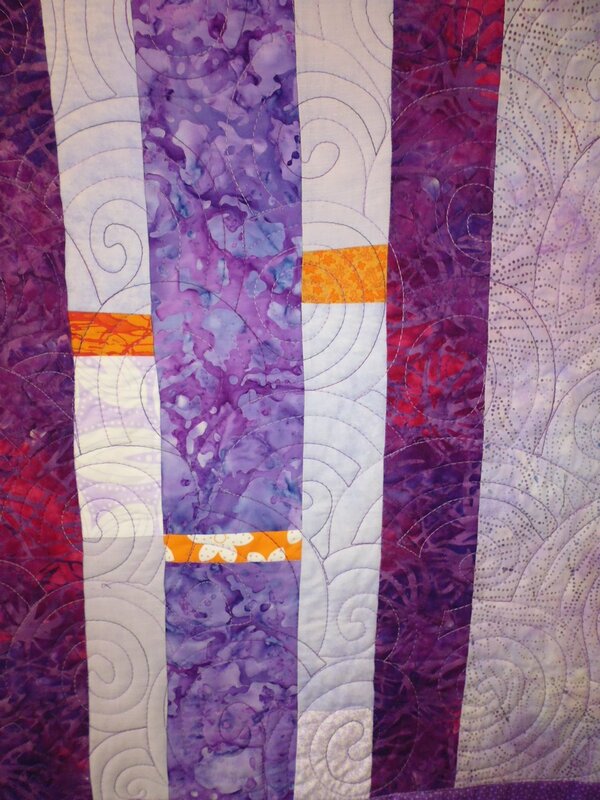 For the top section of each quilt, I did some improvisational piecing with strips of purple fabric, interspersed with flashes of yellow and orange. I then separated the top section from the duck base with a strip of yellow or purple fabric (the ducks on the darker background were separated by the yellow strip). 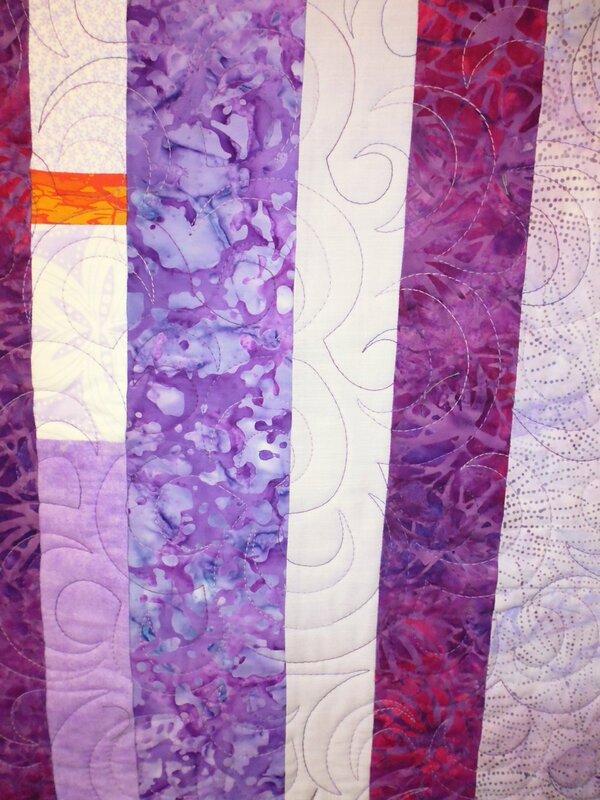 The backing is some purple sheeting I had. I bound each quilt with the dark pink/purple fabric, stitching the binding to the wrong side of the quilt, then pulling it over to the right side and machine stitching it down — I liked the effect as the stitching line is straight on the front and doesn’t need to catch the back as it’s already stitched down. These are so adorable! You did a fabulous job. Any idea where I can find the pattern? 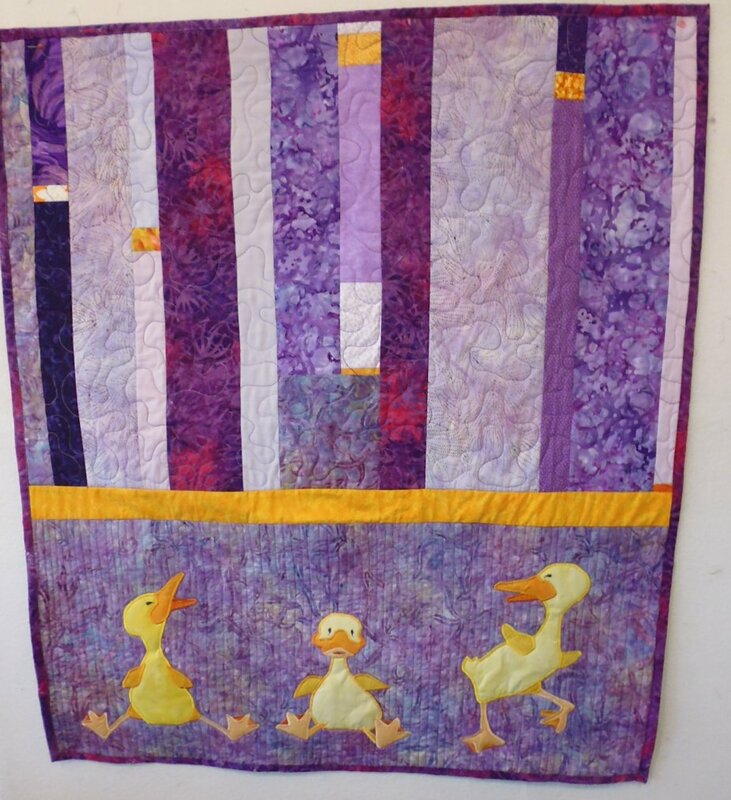 The pattern is called ‘Quackers’, size 40 x 48″, copyright 2006 Rose M Hahn, Hahn Enterprises, PO Box 3468, Frederick, MD 21705. I have no idea if any of this information is still valid, as this was a pattern I bought in a sale bin and it has a copyright date from 11 years ago. Thank you so much!! I will order it tomorrow. Your versions are wonderful! 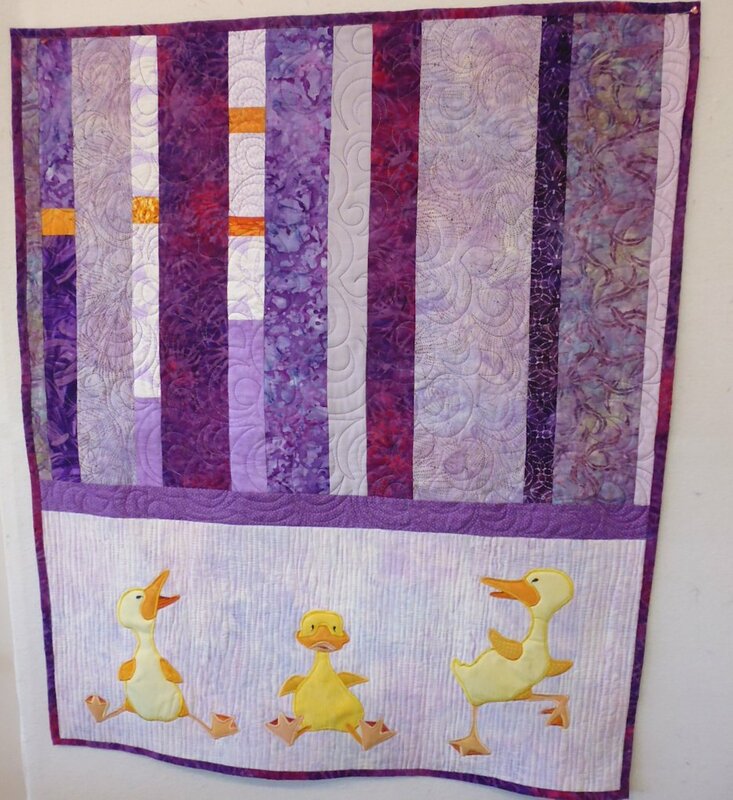 Very clever design resulting in adorable quilts! Thanks for explaining how you went about assembling them.